MG’s Lawn Green proudly created these beautiful sidewalk planters for non-profit Jerome Gun Hill Building Improvement District. Commercial property owners and city planners, give us a call for a free estimate to update your properties and sidewalks. MG’s Lawn Green installed this beautiful white, lattice topped privacy fence for another happy homeowner in Pleasantville, New York. MG’s Lawn Green designed and installed beautiful front walkway with flowers to welcome guests in this Valhalla home. A balanced blend of shrubs in various heights completes the look. MG’s Lawn Green designed and installed this welcoming water feature at Montefiore Einstein Center for Cancer Care. We manage several commercial landscaping clients year round. MG’s Lawn Green added luscious greenery to this office building on Marble Avenue in Pleasantville. From the flower beds to the rock gardens, this project added great interest and value to the property. MG’s Lawn Green manages the beautiful rooftop planters at Montefiore Einstein Center for Cancer Care each season. MG’s Lawn Green designed and installed a beautiful front yard rock garden for this homeowner in Briarcliff Manor. MG’s Lawn Green added various plants, shrubs, trees and flowers to this Valhalla home, increasing its curb appeal and giving the home a complete look. 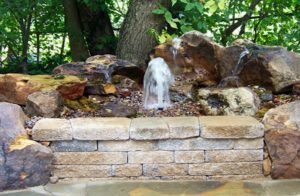 Here are some photos of a pondless waterfall installation job that MG’s Lawn Green installed in Westchester County, New York. The crew does it all from dig to getting the water flowing. See the video of the completed project here. Stella may have been kind to New York City, but not so much in Westchester County where we managed up to 15 inches of snow removal for some of our commercial clients. View the snow totals here on this ABC 7 NY article. Not Sure What You Want? We Can Come to Your Place - No Obligation.